With 2 weeks left at school before the summer holidays I have really been turning to Pinterest to find inspiration to keep Hollie entertained for the 6 weeks, well it will be longer as she doesn’t start school all day until october. I think it is going to be a long time. 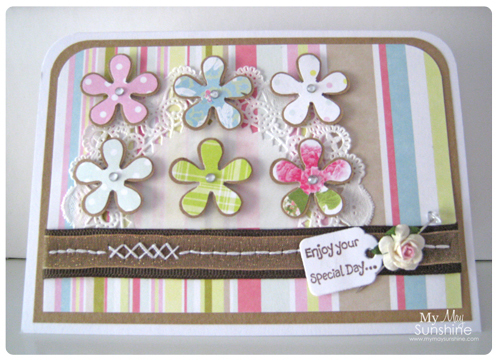 I’m sure I will show some of things Hollie has created here on the blog. In the meantime, I decided to make this card using the Retro Sketches #18 sketch. I like using the sketches that don’t have too many elements as they help you start the card off and then you can go with your imagination. For the flower punches, I used the EK Success flower punch for the kraft shape and then cut out smaller ones for the patterned paper on top, so that it created a bit of colour for the patterned paper. For the ribbon I decided to use two ribbons and got the idea of stitching on the actual ribbon and so gave it a go. It did kind of work but the ribbons kept slipping so the stitching wasn’t straight and didn’t want to add too much adhesive as the needle wouldn’t have gone through the paper and ribbon very well. Paper – Papermania Summer Bloom | Stamp – Forever Friends Black and Gold | Ribbon – Hobbbycraft | Flower – The Ribbon Girl | Diamanté pin – Ebay | Doily – Joanna Sheen | Flower punch – EK Success | Gems – Dovecraft. Skipping Stones Design sketch 141 – Just fluttering by.